There is a playground on the Lower East Side that, theoretically at least, is open to the public during daylight hours. But when Susan Stetzer, who lives next door, would walk by, she often found its gates locked. Each time she noticed, Stetzer took out her cell phone and called 311. A record was made of the problem, and sometimes the gates were opened. But sometimes they weren't. Eventually Stetzer used her role as the district manager of the local community board to find a permanent solution. When she did, her months of 311 calls helped establish evidence of a persistent problem - even if those calls didn't manage to solve the problem themselves. Stetzer and the community board recently reached an agreement with the parks department that will keep the playground's gates open during the day. Mayor Michael Bloomberg established the 311 call center as a single hotline for non-emergency calls to the city in 2003, so that New Yorkers could more easily voice their concerns. Its first two years in operation have convinced many people of its potential - the number of calls to 311 has more than tripled, so that it now receives about the same number as 911. But two years is also time enough to reveal the system's shortcomings. Some have noticed that the speed of service has slowed. "It was getting better and better and better, and then all of a sudden it got worse," said Stetzer, who grew accustomed to calling to report illegal sidewalk cafes and other problems she came across. Tired of the increasingly lengthy hold times, she recently assigned a member of her staff to call 311 for her. Other concerns revolve around how the system is used in the context of city government as a whole. Stetzer and other managers and members of community boards across the city - who see handling constituent complaints as one of their primary functions - criticize the Bloomberg administration for not sufficiently integrating the community boards into its new system. Others have become impatient with the pace of expanding it as a management tool for city government. So, after setting in motion a serious shift in the workings of city government, the Bloomberg administration is now being challenged to follow through. "They're using technology to force changes in the way government works on some level," said Bruce Lai, a staff member for the City Council's committee on technology. "It's a long process - New York City government is massive." When New York launched 311 in March 2003 it was not a new idea. In the late 1990s the Clinton administration conceived it as a way to lessen the burden on 911, and Baltimore and Chicago put the system in place years ago. But New York's system surpasses its predecessors in both scale and complexity. The sizeable project, many say, seemed a logical undertaking for a businessman mayor who had run a media business that took some pains to provide clients with individualized attention. "His City Hall equivalent to that sort of pampering is the new 311 telephone hotline," wrote Christopher Swope of Governing Magazine in August 2004. These services have won over New Yorkers like Joey Arak, who first called 311 in the middle of one night last summer after a car alarm began blaring outside his Orchard Street apartment. The call resulted in the arrival of several police officers, who broke into the car, turned the alarm off, re-locked the car, and drove off. Arak has only called 311 a few times since then, but his experience has turned him into something of a 311 zealot. "Last week I was walking to work after grabbing lunch, and a teenage girl came up to me and said that the cashier in a nearby bodega stole her money and wouldn't give it back or something, and if I had seen any policemen pass by. My reply? 311. Whenever anyone has a parking question, my reply? 311." A 311 operator said that in fact it would probably be more appropriate to call 911 in the case of theft; 311 is clearly the better choice for parking advice. The mayor's rule for remembering which three-digit number to call is "911 for emergencies, 311 for everything else." But what is an emergency exactly? â€˘ There is a fire. â€˘ You feel your life is threatened. â€˘ You witness a break-in, shooting or other crime in progress. â€˘ You see a car accident. â€˘ Someone is having a heart attack or other health emergency. â€˘ Your power goes out. â€˘ You see a leaky fire hydrant. â€˘ You want to report lost or stolen property. â€˘ You want to complain about construction noise. â€˘ It is winter and your landlord has not turned on the heat. â€˘ You are worried your apartment has lead paint. The numbers show that the city as a whole has taken to the system. 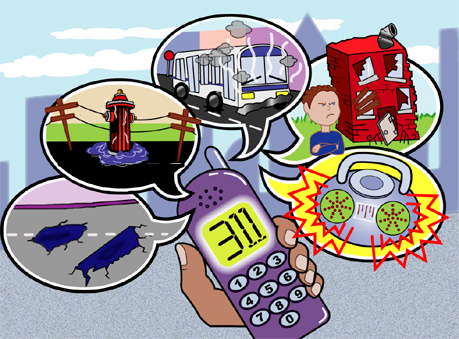 In March 2003, about 310,000 people called 311; in May 2005, it fielded over one million calls. Still, there has been no major change in the number of annual calls to the 911 emergency system, which has remained steady at about 12 million a year. Many people call 311 to complain - over the first two years, heat and hot water complaints and noise complaints were far and away the most common calls. But the city has found the system useful for other campaigns as well. About 96,000 people called 311 in May to request free nicotine patches, and 110,000 people called on September 30, 2004, largely to find out when they would get their $400 property tax rebate. The system has also served as an aide to agencies and public officials. Even the public advocate's office, which runs an ombudsman line that would seem to be in direct competition with 311, has found its job made easier by the new hotline. "Our call volume has actually gone up, because 311 transfers calls to us," said Anat Jacobson, a spokesperson for Public Advocate Betsy Gotbaum. "It's been a really useful tool." For Paul Lee, however, the experience has been more mixed. Lee calls regularly, "sometimes with great success and sometimes with abject failure." (He also posts neighborhood problems to Gotham Gazette's Fix-its.) streetlights or traffic signals go out, the problems are usually fixed quickly, said Lee, a community activist in Manhattan's Chinatown. But he found that 311 was stumped on how to deal with a depression on Pell Street that had grown large enough that "cars [were] sinking into the thing." The city was unable to fix the problem for well over a year, and operators seemed confused and irritated when Lee described the problem interchangeably as a pothole and a sinkhole. The problem persisted until Lee saw a member of a Department of Transportation road crew on the street and asked for advice. "He said 'Call it an undermine. When you say the word undermine, they know what you mean and we'll be right out.'" Lee did, and the problem was fixed within two weeks. "When you get into a zone that has no clear delineation," said Lee, "then it gets a little weird." Since the city launched 311 it has both increased the number of operators it employs and increased the system's budget. [The Department of Information Technology and Telecommunications did not provide exact statistics by press time]. Still, the Department of Information Technology and Telecommunications, is having some trouble keeping pace with its growing popularity. Between May 2004 and May 2005 - a period during which call volumes rose 46 percent - the average time a caller spent on hold went from 18 to 30 seconds, and the percentage of calls answered within 30 seconds dropped from 79 to 71 percent. Gino Menchini, the agency's commissioner acknowledges that this is "something that has to be managed," but also noted that the system is still meeting its goal of answering calls in an average of 30 seconds. "We provide service levels that exceed and are better than what you could get at most banks or other types of customer service institutions," he said. "It's not surprising that as our call volume went up significantly that we had modest increases on hold times." More seriously, the police department also saw a spike in the number of complaints to its Civilian Complaint Review Board despite what many say is a time of relatively low tension between police and civilians, a disconnect that the department explained by noting how easy 311 is to use. Some restaurant and bar owners, meanwhile, say that the simultaneous implementation of the 311 system and another signature policy of the Bloomberg administration - the smoking ban - has been a "double whammy." The smoking ban, said Robert Bookman of the New York Nightlife Association, has pushed customers into the street, increasing tension with nearby residents. Even in times when no noise ordinance was actually being broken, he claimed, peeved neighbors found they could lash out at bars by anonymously calling 311 and making any kind of complaint, such as a report of a non-existent fight. "We have considerable anecdotal evidence that people are using the system to complain that they don't like the bar down the block or the nightclub across the street," said Bookman. "It's causing unneeded inspections that disrupt the business and can sometimes kill the flow of the evening." Some members of the City Council believe that these false complaints waste considerable city resources, and have proposed legislation that would require the 311 system to be able to trace callers much like the way 911 does (Intro 399); (Intro 509). Menchini questions the scope of the problem, and says asking 311 to keep track of callers will cause longer hold times without actually discouraging false complaints. While about four of every ten calls placed to 311 are immediately transferred to the correct agency, the system has always been envisioned as more than a citywide switchboard. Those who run 311 - and those who think they could run it better - are looking at other ways to use the system. The 311 system has integrated the buildings department's schedule into its database, and 311 operators can now arrange for visits by city building inspectors. The Department of Information Technology and Telecommunications is now working with the New York City Housing Authority to do the same thing. Others say that 311's real potential lies in the immense amount of data it has accumulated. There has already been a move to take advantage of this. The police department recently announced that it was establishing a "Real Time Crime Center", which allows detectives to tap into the 311 database, along with several other information sources, to get timely data for investigations. But critics say that the city has not done nearly enough. "311 has been a way of directing phone calls better. It has not been used as a real management tool," said City Council Gifford Miller at a recent debate between the Democratic mayoral candidates. "What doesn't happen is the next step, which is to say, "Okay, we've received 20,000 phone calls. Where are those phone calls coming from, how can we now better direct our resources?'" The public advocate's office and community boards have made similar statements, saying that the data in the 311 system should be used more extensively in the budget process. Menchini says that such data analysis has always been a part of the plan, and that critics should realize that the two-year old system is still developing. "If you tried to do everything at once," he said, "you'd get nothing done." Even if it is easier to complain about inattentive landlords, pothole-ridden streets, or noisy bars, the real question is whether these problems are actually getting fixed. "At the end, when the agency doesn't do anything for you, all 311 has done is gotten you to a dead end," said Jacobson of the public advocate's office. Jacobson notes that there are other avenues for people who need the city's help, and 311 has not eliminated the need for them. While the system can resolve simple issues, she said, complicated problems often need the more extensive follow-up of a public advocate's office or a community board, as was the case with Stetzer's playground on the Lower East Side. The city's 59 community boards have seen 311 as a mixed blessing. Craig Hammerman of Brooklyn's Community Board Six says that 311 has freed up his resources by giving his constituents an effective way to handle most minor complaints. "No citizen should have to call a community board to get a pothole fixed," he said. But Hammerman and others also see major problems that 311 needs to address. In a survey of community board district managers taken last fall by the public advocate's office, 80 percent of respondents said the system needed to be improved (in pdf format). A large majority said 311 call takers lacked knowledge of city agencies, that the system failed to solve problems in a timely manner, and that the tracking system needed improvement. Only seven percent found the system's capability to follow up on complaints satisfactory. But the community boards' real beef with 311 is that is has narrowed their view of the communities, because they are getting fewer calls themselves. The city is aggravating the situation, they say, by not sharing the information about complaints it's getting, leaving community boards without the information they need to do their jobs. "We have to evaluate service delivery in our district; we have to make recommendations for renewals for [liquor] licenses and sidewalk cafes. How do we do this without knowing the number of complaints?" said Stetzer. In response to these arguments, the City Council, through the Committee on Technology in Government, introduced legislation initially over Bloomberg's objections, that will require the Department of Information Technology and Telecommunications to provide a monthly report online of complaints registered with 311, broken down by community boards. The law will take effect later this summer. Some community boards see the law as a step forward, but critics say that it will not provide the kind of detailed, up-to-date information that they need to do their jobs. Menchini says that the law will provide not only community boards, but business improvement districts and private citizens, with information that will allow them to better participate in the problems of their communities. "By making information available on the web, everybody gets to be a participant," he said. "Everybody gets to understand what's happening."